Yorkshire-based quarrying and recycling specialist Wentvalley Aggregates & Recycling has taken delivery of a new R 976 crawler excavator from Liebherr to feed its 90 tonne jaw crusher and maintain the quarry’s high production rates. Quarrying and recycling specialist Wentvalley Aggregates & Recycling owns and operates a state-of-the-art recycling facility within the grounds of a yellow limestone quarry in West Yorkshire where recycled material is sold alongside virgin material removed from the quarry. 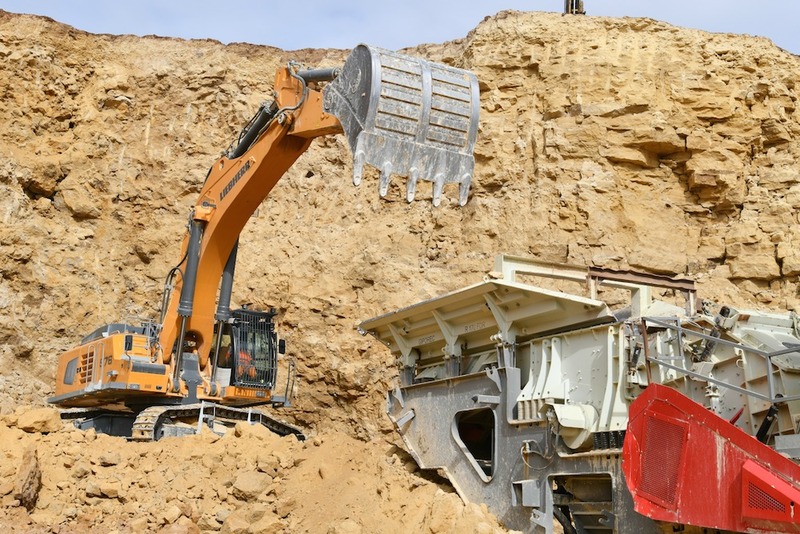 The operation, which has been going for over eight years, is owned and run by Russell Meakin and currently produces in excess of one million tonnes of mixed material per year. There has been significant investment in upgrading plant and equipment to deliver a constant flow of material and when the company invested in a 90 tonne Giporec R170FDR jaw crusher, an equivalently substantial machine was needed to load it in order to maintain the high production rates required at the quarry. Having successfully used a Liebherr R 974 excavator for almost a decade, Wentvalley decided to purchase the 80 tonne excavator’s replacement model and has recently taken delivery of a new R 976. ‘We looked at other manufacturers but have had a good relationship with Liebherr,’ said Russell. Fitted with a 5.5m3 direct mount bucket, the R 976 has been supplied with a 7.2m mono boom and 3.3m dipper, which is designed to give a combination of excellent breakout force and reach to load the crusher’s hopper. Rob is able to reach enough material to keep the crusher operating for about half a shift, working on a 3 – 3.5 m high bench of blasted material. The combination of a 14.1 tonne counterweight, and a heavy-duty 3.5m wide undercarriage, ensures the excavator remains totally stable, even at full reach, with almost 10 tonnes of material in the fully outstretched bucket, which is a larger capacity version than on the older machine. 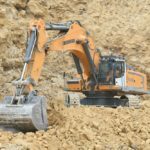 Once the pile of blasted material has been exhausted, the team can quickly reposition the feeder conveyor, crusher and excavator to the next bench, where operations are resumed for the remainder of the shift. 600mm double grouser shoes give the excavator ample traction to get up onto the loose material, and the large, heavy-duty galvanised access ladders mounted to the track frames have been designed to deflect errant rocks. Combined with a sturdy handrail and access catwalk, the climb to the cab is quite easy, and Rob is generally pleased with the upgrade on the Liebherr cabin compared to the older R 974. Power to the excavator comes from the company’s own 16 litre V8 engine, which delivers 544 HP at 1,800 RPM. An AdBlue SCR system brings the engine up to Tier 4f exhaust emission standards with the machine claiming to be more fuel efficient than its predecessor. However, for Wentvalley, production is the most important thing: ‘We need to get the material out of the gate and to do that we need to put it through the crusher and the Liebherr helps us achieve that,’ Rob said.